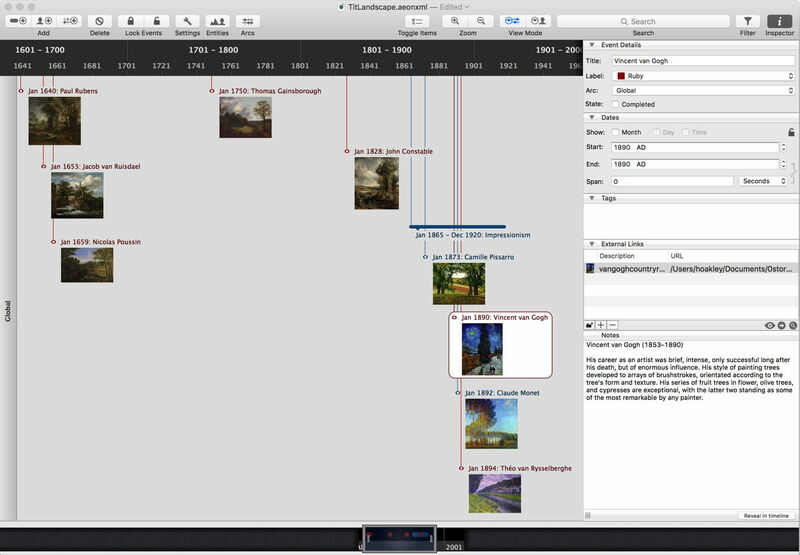 The second app which I have used to create timelines with is Aeon Timeline, at £29.99 one of the Mac App Store’s middleweights. 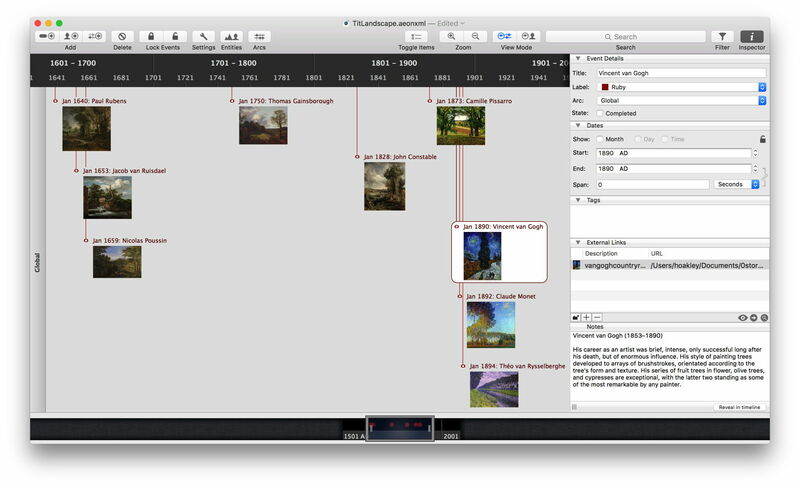 Whereas Timeline 3D exports similarly laid-out timelines in a rich range of formats, Aeon Timeline has a huge range of features and controls to vary structure and layout, but a more limited range of export formats. For a start, it is not just concerned with events (and event periods). It also has entities – typically people in a narrative, for example – and arcs, which are groups of events and entities. It thus copes with very complex timelines by allowing you to structure them, and has tools such as filters which help further. It also does simple jobs, such as my timeline of paintings of trees, very well. Starting at that basic level, you just click the Add New Event tool at the top left of its window, and fill in the blanks for your first event. This new event editor does not give access to all the data for an event, but gets it on the timeline ready for completion using the Inspector. Adding an image, or any other external link, is performed neatly using the tools provided in the Inspector’s External Links section. 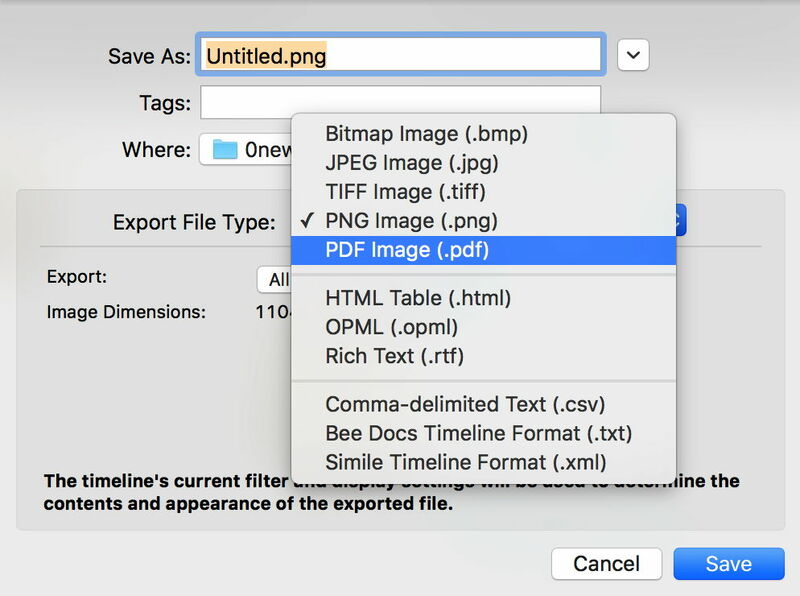 Because adding images to the document would quickly blow it up in size, Aeon Timeline makes a smart link to the original image file. You will also need to adjust the size of the images displayed on the timeline, using the Settings tool; by default they are tiny thumbnails, but can be grown to almost any size you might wish. Double-clicking an image in a timeline event enlarges it using QuickLook, and you can click the button to open the image to full size in Preview if you wish. Period events are shown as proper time bars, occupying the duration determined by the start and end times. However for some odd reason there appears to be no way to get them to extend a vertical line to the time axis at the top, marking their end. I did try to see if this could be performed better using entities, or in arcs, but it does not. The settings tool offers a wide range of document settings, including date formats, display widgets, fonts, and more. However it does not appear capable of revealing the note text attached to events, which is only shown in the Inspector. This seems a curious omission, which means that the only text displayed is that of the date and the event label. You can set all sorts of calendars and delimiters to determine the window of time which is shown on the timeline. 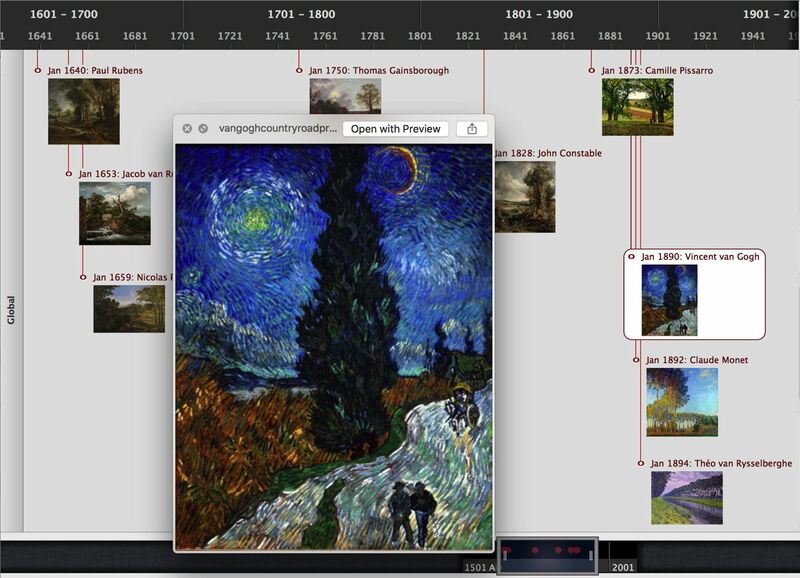 Although it takes a little getting used to, the neatest way to do this is using the tool at the foot of the window: drag the right edge of the magnifier to alter the period shown in the timeline view above, and drag over it to move through time. At first this felt clumsy, but I quickly got the hang of it, and it is really ingenious and neat: an excellent piece of interface design. That said, image and PDF output are exactly what you would expect, and would cater well for display wherever you want to use a timeline: they are just not interactive in any way. 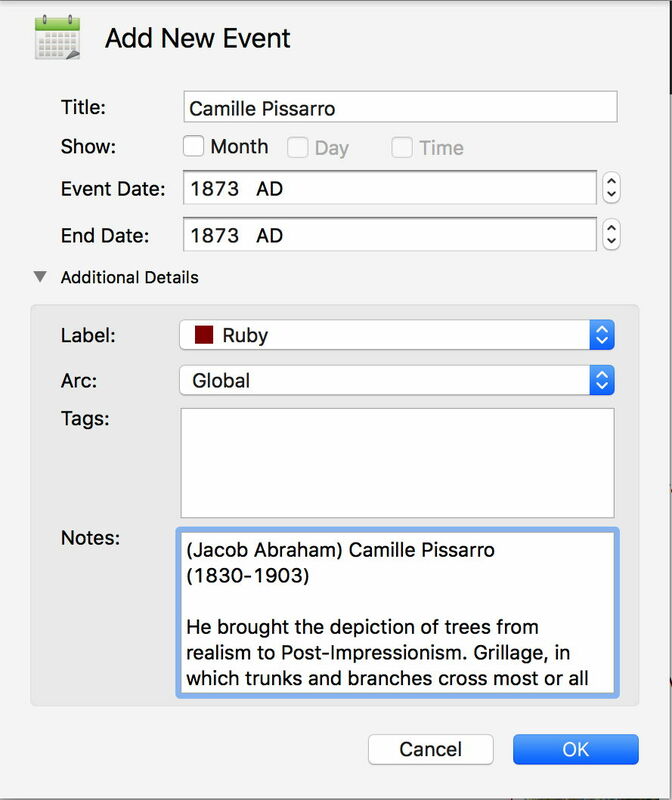 This is just scratching the surface of a very powerful tool which is as useful for analysis (for example of literary works) as it is for creating display timelines. 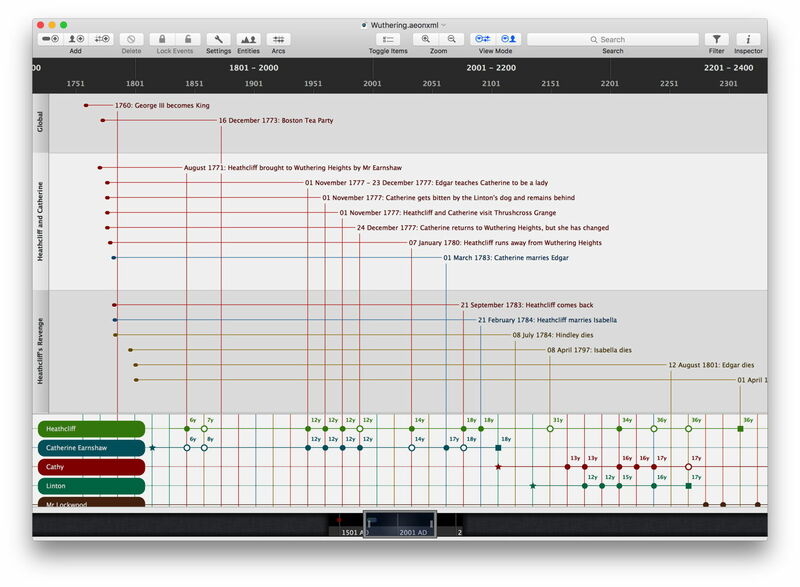 Aeon Timeline for OS X: example timeline of Wuthering Heights. If you are looking for animation and clever tricks, Aeon might look relatively dull. 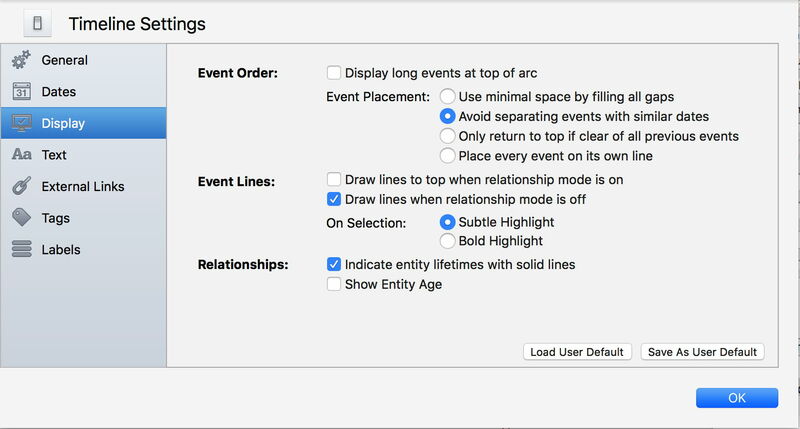 But it is very sophisticated and capable, creating a very wide range of timeline types, with rich display and layout options. It is essential for anyone working seriously with timelines and chronologies. Posted in General, Macs, Painting, Technology and tagged Aeon Timeline, chronology, history, narrative, sequence of events, time, Timeline. Bookmark the permalink.